Watching HTTYD while waiting for Hannibal to load up and doodled some Night Fury-ness. what a great sense of anatomy! it's absolutely amazing keep it up!!! Love the style. It looks more like what Toothless might appear to us in real life, while still having those cute, cat-like qualities. I love the drawing of him with the fish, it is so cute. Nice, using this for a nightfury drawing, no worries, shes deep purple, not black! Whoa, this looks like the all-awesome-realistic-cool-night-fury-of-doom-and-damnation. Good job! Whoa, love the huge wings! Holy butts this is beautiful! 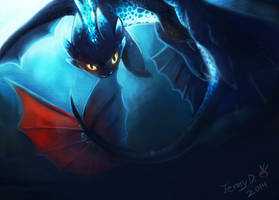 I don't think I've seen a Night Fury drawn as beautifully as this. It makes me super happy. Oh wow, I love your style xD It brings some edginess to Toothless' soft edges! Love it! I love the head and the wings man! AWESOME!!! 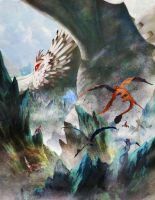 you just made an amazing dragon even more amazing. I just LOVE the way he looks in your style, awesome stuff! excellent ref! it helped me a lot! I have to say, I like his wings better this way. And just when I thought that toothless couldn't get any cooler! HOW IS IT THAT OU CAN DRAW SUCH AWESOME NIGHT FURYIES!!! HOW!!! Doodle? What is this...'doodle' of which you speak? For I say that THIS is no 'DOODLE'!! this is amazing! i cant describe how much i love this.